What can you do with a bunch of old brooches? Repurpose and reuse! I’m a sucker for a fun, crafty project. Especially one that is so easy you can finish it in ten minutes. It all started with this sweet leather skirt. An immaculate midi pencil skirt in butter soft black leather that I thrifted about three weeks ago for…get this…$10! Here is the back view of the skirt…I’m building up the suspense of the DIY reveal! When I went to style this skirt I reached for my jean jacket worn as a top. It the reverse of the standard black leather jacket and jeans. It was okay but there was a little je ne sais quoi missing. I could have reached for a scarf, or one of my fancy necklaces, but I really wanted to add something to the jacket itself without reaching for my sewing machine or paints, both of which would have been permanent additions. That’s when my vintage brooch collection called out to me. Styling vintage in a contemporary way is a little pet project of mine. I love showing people that “old” is good. Since this vintage brooch DIY isn’t permanent I can add or remove brooches as I like. It turns a ho hum jean jacket into a statement and conversation piece. I picked up a few more brooches to add to this today. Ideally I’d like that whole shoulder area covered in vintage brooches. My vintage brooch collection was a little sparse as I’d already used up a big selection of my stash on this DIY clutch. I may have been subliminally inspired by by Constantinos pinned jean jacket. The wonderfully creative Mis Papelicos also had a similar idea here. I think Mis Papelicos and I are creatively connected somehow. We often create similar DIYs at the same time even though she lives on the other side of the world. Accumulate a nice little selection of vintage brooches. Thrift stores, estate sales, flea markets and vintage shops are the best places to find vintage brooches. Move them around on the jacket until you find the layout you like best. Pin them on and voilà you’re done baby! It doesn’t get easier than that folks. Would you wear this jean jacket? How nice! You’re mad talented. And I love that skirt. If it’s worth doing, it’s worth overdoing! The mass or, as Helga Von Trollop used to call it “scrum of brooches” looks far more fabulous than just one, doesn’t it? Of course I’d wear this….I can’t think of one reason not to!! And my mother could probably fill up the back of the jacket with all of her brooches!! And that leather skirt is marvelous on you—is it real leather? Yes : ) Real leather. A very high quality soft black leather. I actually picked up two leather skirts that day as they were having a 50% off all skirts manager’s special. That is why I love Thrifting at Talize. That looks so good, I wear pin badges on my leather jacket, but I never thought of doing similar with vintage brooches, what a cool twist! Very creative! I collect vintage brooches as you know and wouldnt have thought of that. Love the pine green leather skirt. Ah…I can see that taking my photos indoors is still causing some issues with colours. The skirt it black leather. Ah, I imagine it could be the computer screen, ur photos are quite good, and I love the skirt either black or grey. ? Ah, I imagine it could be the computer screen, ur photos are quite good, and I love the skirt either black or green? Oh so good – but I worry about getting my hair snaggled in them (same thing goes for sequin jackets) – but then I could always pile the hair up and pop on a casual tiara – any excuse for tiara-time. The brooches look so lovely on denim (or tweed) – and what everyone else said about that excellent skirt – so very flattering and unfussy – it looks amazing on you. Do you think that would work on a hatband or would I need to do bar bell shrugs to build up neck muscles first lol?? These brooches aren’t as heavy as I thought they’d be so I think they would work on a hat band if you chose wisely. I didn’t think about the hair snagging thing. So far my fine slippery hair hasn’t snagged. Touch wood. Looks very cool! And I like how the outfit is the inverse of a black leather jacket with jeans (which is also the ultimate in ‘cool’ looks). Great idea with the brooches–depending on the brooches/pins used, you could get totally different looks out of the one jacket. That’s why I like this DIY. I’ve already added and changed up my brooches since I took these photos. It is looking better all the time. Really, you’ve nailed your indoor lighting issue. These are such pro photos. I love your reversal of denim and leather. You’re a schtar. All I need now is a collection of vintage pins…aaack! Now I have to run. I’ve got to find a box before they are all gone!! The leather skirt is beyond a great find and I love how you use the brooches to make a fun statement on your denim jacket. I only have Christmas brooches that I’ve received as gifts and not sure they would look as cute like you did here. What a great idea – you are so creative. I have a few brooches that I brought home after my grandma passed away. I need to get them out and wear them! Love the skirt too. I really like this, is giving me a light bulb moment! I may see what I can work up on my two jean jackets, I like this way better than a bunch of jewelry on. Is giving it real focus. Thanks for the compliment : P. I’ll take it and run with it! Now I just need to figure out how to have my studio lights follow me around everywhere I go. Only $10.00 for that beautiful, buttery leather skirt??!! We need to thrift together someday…do you ever come to Vegas? in love with your jacket! Addicted to brooches too lately! The skirt is another fabulous find! I really like the jean jacket with it. And the vintage brooches are perfect with the outfit! I don’t think I own a single brooch! I’ll have to change that! (I do own A LOT of necklaces however…). I love a denim jacket and this is a great idea that I am going to have to borrow (read : blatantly copy)! I just need to collect some pretty brooches. Yes, I would most definitely wear that jacket! Those closeup shots of you are gorgeous, gorgeous, gorgeous! I used to wear a pile of small brooches on an oversized man’s blazer when I was younger. You are having amazing thrifting luck lately! Can’t believe the skirt was only $10, and it’s a marvelous length. 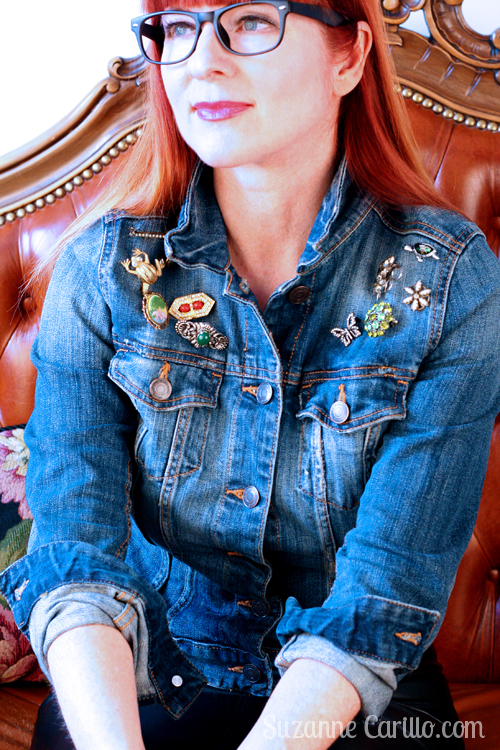 oh yes, you and fabulous Sacramento are rocking your brooches over jean jackets, and looking Gorgeous! Love that you’re encouraging us to wear our vintage brooches with a modern twist, such an inspiring advice! Jeans jackets are difficult for me, but I do like what you did with this jacket. I did this once to the jacket of a black skirt suit by D&G. Looked also very good. This skirt (which looks bloody good on you) benefits from the denim jacket. Is that called a juxtaposition? Ooh, what an absolutely brilliant idea! I used to wear a lot of brooches in the 80s and 90s and they have just been sitting in my jewelry boxes. As far as the shoulder goes, I have a little blue jeweled dragonfly that I used to pin on my shoulder all the time and that is definitely going on the shoulder of my jacket. I just love it. I dub this look “CEO Punk” love it! This is so quirky, and funky, and cool! It reminds me of the heavily embellished Dolce & Gabbana fashions for spring. There’s lots of brooches and bejeweled pieces. I feel like this is something Anthro would sell, brooches already attached, for $400. I’m definitely going to do this. Maybe I’ll pop into a thrift shop this weekend to pick up some brooches! I have a few passed down from my grandmother, and it might be fun to mix and match them with other treasures. 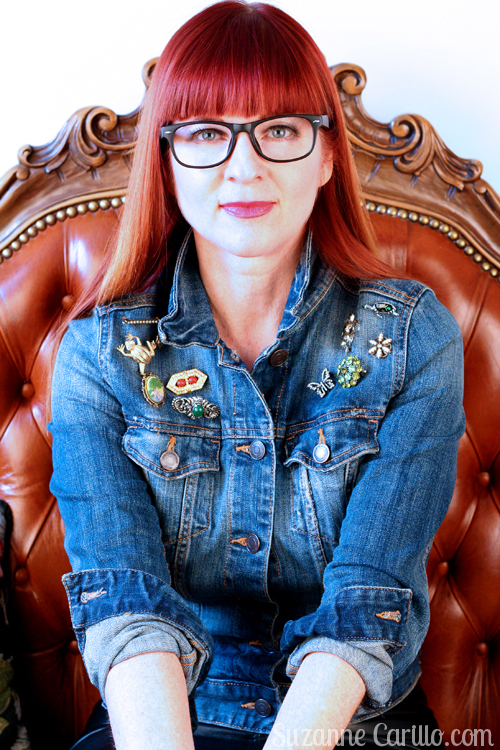 I love curating things, so the thought of curating my own embellished jacket has me feeling excited and inspired! You are awesome! I have found that WONDEROUS jean jackets and jeans can be found in thrift and consignment shops. Denim is so classic in virtually all its forms you can rarely go wrong. Who’d have thought that the high waisted “mom”jeans would be so sought after once again and there are many to be thrifted at bargain prices. Like you Suzanne, I absolutely love to concoct (and often complete) ideas for embroidery, beading, applique, and recently patching on denim type garments. And I also snapped up a great high quality leather skirt for $9 at a local Goodwill a few years ago. At 65 I’ll never give up my devine right to wear denim and leather. You DON’T need to be biker chic . It’s all about attitude and tradition. Age just isn’t a factor!